With his thinning hair, slightly paunchy figure and unassuming manner, my 10th grade biology teacher wasn’t the kind of guy to win a teacher-of-the year contest. But to a 16-year-old boy he held a certain fascination. 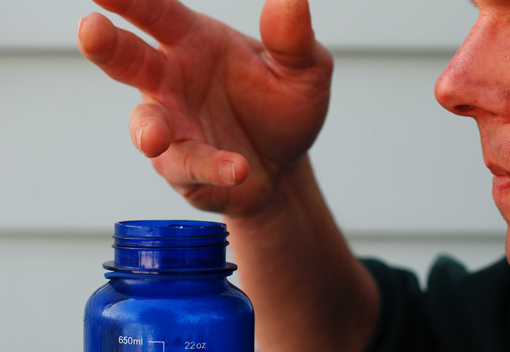 Dr. Bob showed us how to smell (or not smell) the contents of an unmarked bottle: fanning his fingers over the open cap and standing back comically so as not to inhale directly any unknown contents. And he had a weird habit of addressing us all by our first and last names, run together as one word. What clinched it for me, however, was the edible wild plant project he assigned to me that spring. The next day, Dr. Bob dumped a package of half-sheet newsletters on my desk. Thus began my weekly demonstrations on the uses of edible wild plants. The newsletters came from Dr. Bob’s hometown in Maine, so not all the plants described were available in Eastern Pennsylvania. But I persevered. One week we had a salad made with wild mustard greens, another the tender fiddleheads of some local ferns sautéed in butter. My one near-failure was a tea made with last year’s sumac flowers, which gave off the flavor of old socks and floor sweepings. In response, there were many rumblings of dissatisfaction around the room. At the very last second one kid leapt to his feet raving about it (thanks, DaveKustin!) and so I got credit in the end. Dr. Bob stood to one side mildly grinning. My greatest success was with Fried Dandelions. 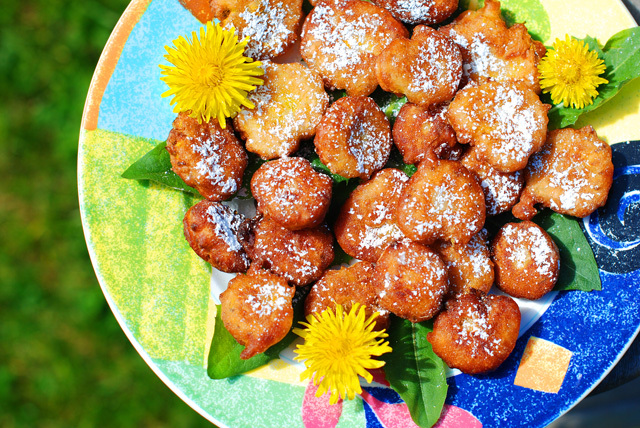 Just the flower heads – dipped in batter, fried and sprinkled with powdered sugar. They had a flavor somewhere between artichoke and arugula, and for novelty factor were a real hit. Before I knew it, I was making a second and then a third batch as news spread to other classes on the hall. I don’t remember whether I bagged my ‘A’ or not. What I do know is those brochures sparked an interest in my seeing the natural world as an outdoor grocery store that I hold to this day. Now, when I pluck a wild northwest mushroom from the woods, I see in my mind’s eye Dr. Bob’s understated grin of approval, and it takes me right back. As for dandelions? You can curse their appearance, or seize the moment to enjoy these first-of-the-season beauties. And what better way to get back at them for their peskiness? Go on; fry them up and eat them! Here’s my recipe. Dandelion note: The best dandelions for this are young, tender and medium-sized (about 1” across). 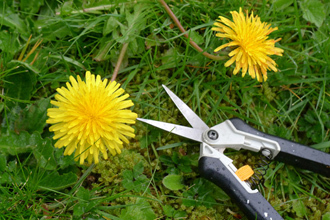 Pick them from a lawn or bank that you know has not been sprayed with weed killer. They’re at their freshest in the late morning when they first open to the sun. Oh, and they’re packed with vitamins, too! Make the batter: In a shallow mixing bowl, mix the flour, baking powder, salt and sugar together well with a fork. Now gradually stir in the water and milk to create a smooth batter. Work out the lumps and scrape the sides as necessary. 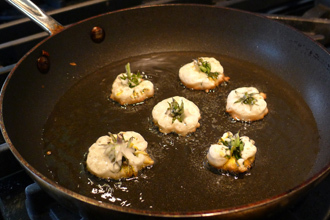 Heat the oil: Pour the canola oil into an 8” frying pan and heat it slowly over medium heat. The oil will be ready when a test dollop of batter cooks to medium brown on the bottom in 30 seconds. Arrange a plate with two layers of paper towel beside the pan and have a spatula and a pair of tongs handy. 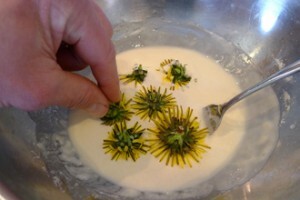 Make the fritters: Dip 6 dandelions at a time yellow-side down into the batter, using the green knobs as handles. Quickly fork a little of the batter onto the green bits, but don’t try to coat the backs entirely. Put the 6 battered flowers face down into the hot oil so that they keep their flower shapes and fry for 30 seconds until medium brown. Now flip them over, pushing the tops gently with the spatula as the green sides cook, and fry for a further 30 seconds. Using the tongs, remove the fritters to the paper towel to cool. Repeat the process until all the flowers are fried. To finish: Sprinkle with powdered sugar and serve warm. And as you bite in, I want to ask you the same question I asked my 10th grade friends on that day so many years ago: Can you believe that anything so weed-like as a dandelion can taste so good? Yum! I love harvesting the wild dandelions in our yard, the leaves are great in salads, and now I have a great use for the flowers, edible indeed! Yum! Can’t wait to try these. We already have plenty of dandelions in our yard. I forwarded to my science teaching hubby. Great story. My Mom told me I used to eat them as a kid, I bet I will like them even more fried! Amazing! I’ve been eating the leaves in salads (the French use them a lot) but never occured to me that you could even eat the flower heads, too. You’re just brilliant. Great post! I don’t think I knew you could eat dandelions! I want to go search for some in our backyard now!! What a cool idea. I love the idea of finding your own food (not treated with pesticides or growing in tained soil. Fortunately I have access to farm fields where I keep my horse and find all sorts of goodies. I’ll add this to the list and play around with some spice additions! Thanks. I had no idea you could eat the flowers too. They do look good! Your teacher sounds like quite the character, love the photo demonstrating his technique., hehe Have a great weekend! Eating dandelions?? WOW! 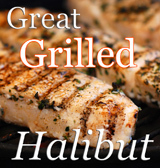 That’s something I would have never thought to try… this certainly sounds delicious! We make every year about 100 kg dandelion jelly but never tried to fry them. We fry Elder blossom and zucchini flowers. later in the season. We will sure try your recipe today. My dad (who was from Virginia) made these every spring. The only thing he did differently from what you did, was to cover the entire skillet bottom with the dipped blossoms, then turn them all at once like a pancake. After they’d drained and cooled a bit, we pulled them apart, and sprinkled them with confectioner’s sugar. I haven’t made them for years, because we don’t have a fenced yard and our neighbors have animals, but I crave them every spring. You can use the same recipe for pumpkin blossoms. Excellent! Yummy! I saved this one to my recipe file. I used almond milk and it worked fine. 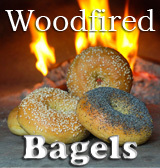 Next time, I will try a non-wheat flour and see how it goes. To think a few years ago, I was spraying Round Up on these precious gems! D: Thankfully, I have been enlightened.